I’ve long advocated drinking tea in lieu of coffee, but the downside of modern food technology is again rearing its ugly head and causing brand new health concerns over this otherwise healthful brew. A recent article in The Atlantic1 raises questions about the safety of plastic tea bags, some of which have fancy pyramid shapes, designed to allow the tea leaves to unfurl during infusion. Chances are you’ve never even given the tea bag a second thought. But indeed, some of the newer tea bags are made with a variety of plastics; some are nylon, some are made of viscose rayon, and others are made of thermoplastic, PVC or polypropylene. Anyone aware of the dangers of plastic chemicals leaching out of plastic containers and bottles is likely to be concerned about drinking tea steeped through heated plastic. Considered a potential carcinogen by the National Institute for Occupational Safety and Health2 (NIOSH), epichlorohydrin is also used as a pesticide. Besides making its way into tea bags, it can also be found in coffee filters, water filters, and sausage casings. When epichlorohydrin comes in contact with water, it hydrolyzes to 3-MCPD, which has been shown to cause cancer in animals. It’s also been implicated in infertility (it has a spermatoxic effect in male rats3) and suppressed immune function4. This chemical is already a well-known “process contaminant” associated with modern food production. According to the American Oil Chemicals Society5 (AOCS), 3-MCPD can also be found in variable levels in refined vegetable oils, which is yet another reason to avoid such cooking oils and replace them with organic coconut oil. Do Plastic Tea Bags Pose a Health Concern? As you probably know, chemicals in plastic containers and bottles have been found to leach into food and drink, thereby posing a number of health hazards. Examples include bisphenol-A (BPA), bisphenol-S (BPS), and phthalates, all of which mimic hormones and act as potent endocrine disruptors. Unfortunately, according to the featured article, neither the Center for Health, Environment, and Justice nor the Center for Disease Control and Prevention (CDC) have any information on the toxicity of plastic tea bags or the levels of plastic chemicals that might migrate into the tea when steeped in hot water. Hard to believe, but true, the US federal agencies are not supervising this potential toxic exposure. “Could plastic tea bags also be bad for our health? They are most commonly made from food grade nylon or polyethylene terephthalate (PET), which are two of the safest plastics on the scale of harmful leaching potential. Water boils at 212 degrees Fahrenheit (100 degrees Celsius). In the case of PET the glass transition point (Tg) is about 169 degrees, and the breakdown point of nylon is even lower than PET. “If the question is, ‘As the polymer goes through that transition state, is it easier for something to leach out?’ ‘the answer is yes,’ said Dr. Ray Fernando, professor and director of polymers and coatings at Cal Poly San Luis Obispo,” The Atlantic states. The now defunct Dexter Corporation was the initial owner on the patent6 of a method for treating both tea bags and coffee filters with latex (plastic), to aid in preventing tears that allow the tea leaves/coffee grounds to leak. This invention “saturates and completely impregnates” the entire web material. Therein lies one of the problems with paper tea bags as they are frequently treated with epichlorophydrin, which hydrolyzes to the carcinogen 3-MCPD when contact with water occurs. A good way to protect yourself and your family in this area is to purchase your tea from manufacturers who can certify that their tea bags do not contain this compound. Organic India, for example, has sent me a confirmation that the paper used for their tea bags does not contain epichlorohydrin. In a 2009 article, Kristie Leong, MD also claims to have done her own inquiries and that Bigelow Tea Company does not use the chemical in their bags8. 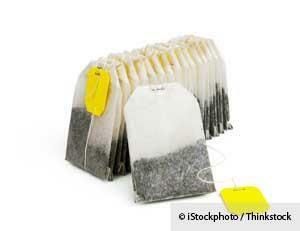 Many plastic tea bags are advertised as “silky” or “mesh bags,” or they’ll have fancy shapes or oversized bags. I’d suggest avoiding those as well if you want to be on the safe side. Your best option would be to opt for loose tea. This does take longer, but it can be well worth the wait. One of my favorite teas is Royal Matcha Green Tea, which has one of the highest levels of the potent antioxidant epigallocatechin gallate (EGCG). Unlike other teas which you steep and strain, matcha tea is a powder made from ground green tea leaves. You add the powder right into the water. You are consuming the whole leaf, which makes matcha one of the healthiest green teas available. Another excellent option is loose Tulsi tea leaves. This well-known Ayurvedic herb is also full of antioxidants that fight free radicals in your body and prevent oxidation damage. Add boiling water. Use the correct amount for the amount of tea you added (i.e. for four teaspoons of tea, add four cups of water). While some tea bags—whether plastic or paper processed with epichlorophydrin—may pose a potential hazard, please don’t let that deter you from drinking tea altogether. Although I still believe pure water should make up the majority of your daily fluid intake, high-quality tea has numerous health benefits to offer. Among them is growing evidence that the polyphenols in tea, which include EGCG (epigallocatechin gallate) and many others, can be protective against cancer. For example, the polyphenols in green tea appear to be even more effective at fighting the progression of cancer than the antioxidants found in red wine and grapes. So keep these tips in mind, and go ahead and enjoy a cup or two of your favorite variety. I personally prefer Matcha tea, a vibrant bright green tea made of tea leaves ground into a powder, and Tulsi tea, which is a powerful adaptogenic herb that provides important therapeutic benefits.